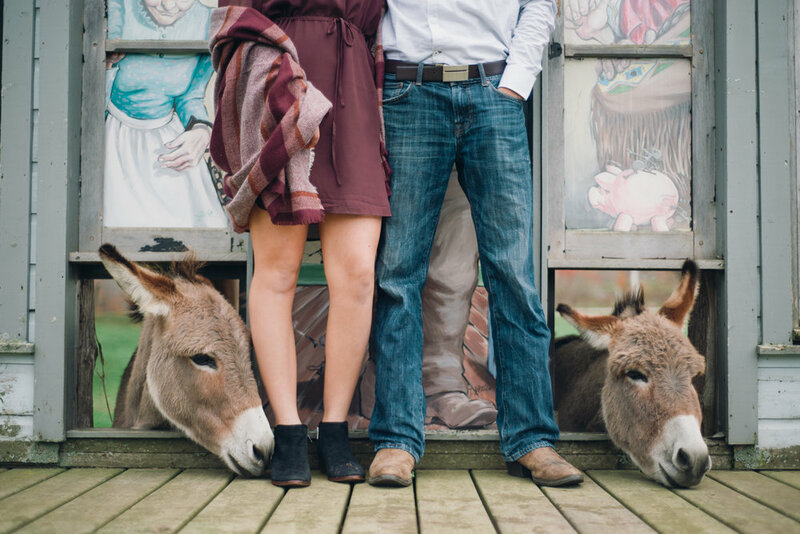 When we pulled up to Long Lake Ranch for Kyle and Deanna's engagement session we were absolutely overjoyed! This place is a photographer's dream, nooks and crannies just picture perfect, donkey noses poking out of windows, horses galloping around and a small western town! Kyle and Deanna love to go horseback riding and camping at Long Lake Ranch, and Kyle proposed to Deanna outside their favourite camping site. It seemed fitting to start our session right outside the very building Kyle lined with candles and popped the question (okay ladies are you jealous yet?) Kyle and Deanna were out on a trail ride, and she saw candles lighting the way to their favourite spot...seriously! Normally we have some music playing for our couples to groove to, but this time Kyle serenaded us with his guitar skills, and when we finished the session and asked if they wanted to dance in the middle of the road, they pulled out sweet dance moves...seriously people they are just a power couple. Can't wait to photograph their wedding next summer!